Clemson Girl: Wedding Wednesdays: Part I - Quick Poll: Would this dress work as a wedding dress? Wedding Wednesdays: Part I - Quick Poll: Would this dress work as a wedding dress? 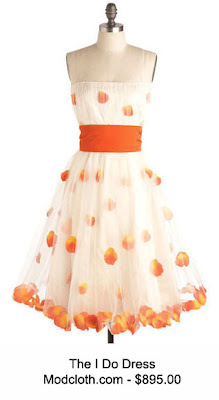 While browsing one of my fave online retailers, ModCloth.com, I stumbled across this gorgeous gown. I never thought twice of it as a wedding dress until I saw the title of the dress - the "I Do" dress. Hmmm...I could see that. A casual, fun wedding for a more contemporary bride? What do you think? It's definitely an affordable option for brides on a budget. Vote below and comment on this post to add more thoughts on the dress. Do you have a Clemson-themed wedding idea? Email us! Stay tuned to the blog for Wedding Wednesdays Part II today to see a gorgeous Clemson engagement photo session! Saw this dress on modcloth.com yesterday and was waaaay confused as to why someone thought it could be a wedding dress. It's pretty, but in my opinion for it to be a wedding dress, it needs to be full length! I think the dress is adorable and perfect for a summer, outdoor wedding. Then again, I'm not a "traditional" gal. If you love the dress and you feel beautiful in it. It's your day girl, it's a beautiful dress. I say go for it. It is your day do what "YOU" want. I think a wedding dress is very personal and for the right sassy bride, I think this dress is adorable!! I agree that it's more appropriate for a very formal evening wedding, but with the right wimsy thrown in here and there, I think it could be a hit!! OOPS! Typo on the last comment! I agree that it is more appropriate for a less formal wedding (not a formal evening event).